Quick, name the motorcycle brand least likely to build an electric vehicle. Until last week, you would have said "Ural" — a company previously known only for its throwback sidecar rigs, with DNA dating back to World War II. And yet, I recently found myself on a winding road through the woods just east of Seattle, trying out the company’s latest project: the batteries, controller, and motor from a Zero S, grafted into Ural CT sidecar outfit. Anyone who stops a Ural in a public place is familiar with something Ural owners call UDF, for Ural Delay Factor, because of the attention they draw. But this one also includes an additional WTF factor. Ural EV prototype. Ural photo. Ural hasn’t given this version a name, calling it only an "all electric prototype." In truth, even the word "prototype" might be too strong; It’s more like a well-dressed proof-of-concept. It’s not the first Ural EV, either; Ural’s CEO, Ilya Khait, told me that a couple of years ago, they delivered a rolling chassis to a Moscow company that was in the business of converting old diesel buses to electric drive. Ilya must have liked the idea of a twist-and-go EV. Part of the appeal, for him is that, despite being a trained engineer, he’s never mastered the intricacies of a clutch and gearshift! When he heard that Zero was interested in partnering with other companies that could use its powertrain technology, he asked them to convert a sidehack. On Zero’s advice, Ural brought in a high-end vehicle design studio, ICG, to help with packaging and styling. That explains why the rig you see here looks so finished (at least, when seen from the left side). ICG’s stylists created that snazzy alloy side panel and came up with the very cute idea of concealing the charging port inside the stock fuel tank, under a stock fuel cap. The conversion is based on Ural’s CT model, which is configured for road use. The CT differs from Ural’s more popular Gear Up model in several ways: The CT is a conventional sidehack, which is to say it’s driven by the motorcycle’s rear wheel only; the Gear Up’s sidecar has a driven wheel. No, I never did sit in the electric chair. Photo by Mark Gardiner. The CT also has a wider stance and carries the sidecar lower on 18-inch wheels, which reduces the tendency to "fly the chair" in right-hand turns. Since sidecars actually benefit from ballast to reduce that instability, battery weight was not an issue. Ural and Zero took advantage of that fact to run two Zero battery packs, a lighter ZF6.5 battery in the main chassis, and a heavier ZF13.0 battery under the seat in the sidecar. The dash appears to be a standard Zero item. The fuel filler cap cleverly conceals the charge port. Ural photo. The dash and motor controller are Zero items, too. Users get to choose between three modes: Sport for maximum torque; Eco for maximum regeneration and range; and Custom. A Zero owner could personalize that Custom setting from her phone using the Zero app. In the case of this one prototype, the setting was configured to optimize performance and range for a vehicle that has more battery capacity but also, of course, weighs 2.5 times as much as any Zero! Zero’s had more experience than most e-moto companies, with the result that their motor controllers are conspicuously good. "Throttle" response is smooth and intuitive. The power’s fed to a Z-Force 75-7 brushless DC motor that produces almost twice the torque of Ural’s current 750 cc internal-combustion twin. As a result, the electric Ural was downright sprightly... for a Ural. During the two days I spent at Ural HQ in Redmond, Washington, I had the occasion to follow the electric rig in a conventional Gear Up, and the gasoline-powered one was no match climbing hills. Most of the time, I was on wet roads, where the electric rig would readily spin the rear 4.00x18 Heidenau away from a stop. Riding a motorcycle with a sidecar is an entirely different experience. Plus, most of the time, I was on wet roads. The combination may have also dampened my enthusiasm for testing the performance envelope. Photo by Mark Gardiner. As usual with an EV ’cycle, the Ural gets underway with a quiet hum. When I last rode a Zero, I noticed the final drive and tire noise. The Ural has a driveshaft that’s virtually silent, but those heavily treaded tires produce a little more sound. Frankly, driving a sidecar is a little, um, "involving." All that weight dangling off one side means that on acceleration, it steers quite hard to the right and under braking, it steers left. Considering the roads I was on, I didn’t feel compelled to verify Ural’s claim of an 88 mph top speed for the prototype. But, I have no reason to doubt it. The prototype’s built on a standard CT chassis. The frame and bodywork are still manufactured in Russia, but the rest of the running gear is from all over. It has a single four-pot Brembo brake on the front wheel, operated the normal way with a lever on the right handlebar. A Hayes single-piston brake on the rear wheel is linked to a Brembo two-piston caliper on the sidecar wheel. The leading link fork is Russian, but all the shocks (there are six in total between the front fork, rear swingarm, and the chair) are made by Sachs. The rims, hubs, and axles are from Taiwan. 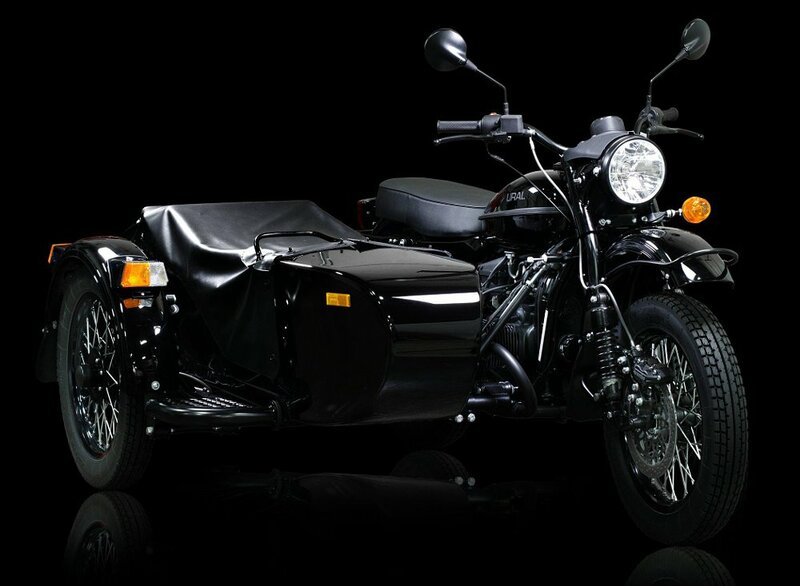 According to Ural, the electric outfit weighs 122 pounds more than the gasoline-powered CT. Since I only weigh 140 pounds and had no passenger on board, the GVW as tested was well within the approved range. In spite of that, the one time I found myself braking hard, the brakes and suspension were up to the task but between the chair wanting to come around and some, uh, "interesting" suspension action, I immediately let discretion get the better part of valor and increased my following distance! This toggle switch engages reverse. Photo by Mark Gardiner. Although there’s a heavy battery in the sidecar, it’s concealed under the seat. Neither the passenger seating area nor the useful trunk are impeded. In fact, the only reason you’d even know about the outboard battery is that there’s a massive cable bundle running between the sidecar and the right side of the ’cycle. That’s an area that definitely still looks "prototype." The Zero motor would normally spin in the same plane and direction as the wheels, with a belt drive on the left side of the bike. So the motor, a squat cylinder, sits centered in a Zero chassis. In the case of the shaft-driven Ural, however, the motor’s been turned 90 degrees and offset, to allow the driveshaft to connect to the motor output shaft. The motor is rotated 90 degrees and offset so the output shaft can be connected to the driveshaft with a simple U-joint. Ural photo. You see why I say a caution sticker would be redundant. Photo by Mark Gardiner. So, as a proof-of-concept, does it seem viable? The electric Ural works. The Zero power pack, controller, and motor are proven, and the rolling chassis has been in development since about 1939. The combination of a vehicle that is light enough to rely on that motor, but heavy enough to carry a lot more battery capacity, almost makes sense. And it’s fun in its own way. You could use it to get groceries or take Fido to the dog park. The trunk is handy. Ural photo. That said, Ural’s official position is that it has “no immediate plans to manufacture an all-electric model at this time.” Building this one bike was an exercise in market research. Whether there’s a market for an electric Ural remains to be seen. It is, after all, a brand built largely on nostalgia. The company will start to answer that question when it’s displayed at the IMS show in Long Beach this weekend. After that, Ural will tour with it, bringing it to dealers where people can try this new/old mashup for themselves. Ilya Khait is Ural’s CEO. He lives in the Seattle area, because more than half of all Urals are sold in the U.S. market (and also, because Seattle is a much nicer place to raise your kids than Siberia). Photo by Mark Gardiner. 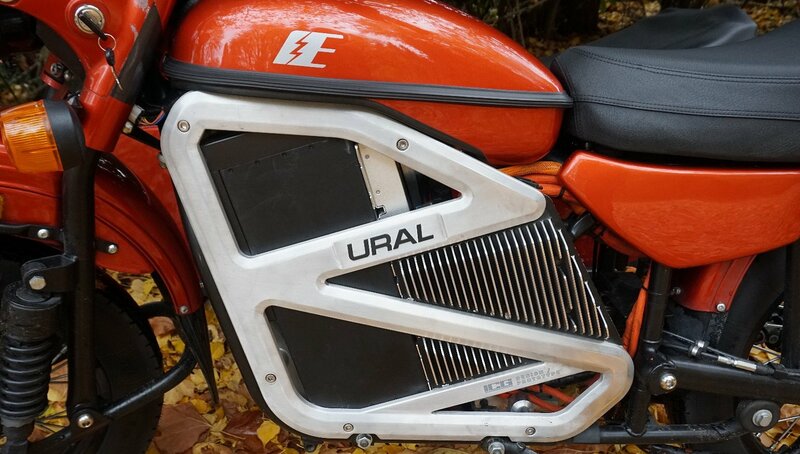 If there’s enough demand — and by "enough" I mean, if dealers think they can sell even a few dozen — there’s a good chance Ural will manufacture an electric outfit. The company says it would probably take about two years to bring it to production. Even if there isn’t enough demand to support production, all is not lost. When I was at Ural HQ, Madina Merzhoeva was pretty forthright in admitting that Ural — which is too small a company to support a big advertising or marketing effort — uses special projects to get press. They recently announced a limited run of Gear Up outfits equipped with a drone. That story was picked up by media outlets around the world. Whether the drone bikes are really profitable in their own right or not, they were featured on web sites, and in newspapers and magazines around the world. Even if Ural never builds an EV, this weird prototype’s already generating plenty of buzz.